Biochem Belle has been chronicling her career path from academia to ‘not academia’ in a series of blog posts. Part 3 is particularly about the transition point, one that sounds like it took awhile to get to. Dr. 24 hours also wrote about figuring out a career by a sort of ‘faking it til you make it’ approach that kind of runs anathema to academia. He wonders why academics have can’t just do that. This is on my mind…as a pre-transition phase academic, still trying to figure out what direction works for me…not just careerwise, but in life. Why do academics have such trouble transitioning? Training? Lack of skills? I don’t quite think it’s either of those things. There’s a mindset that gets cultivated in academia. Some of it is due to a narrow devotion to a task and being in a culture that sends the message that the tenure track is THE path, nothing else. But that is starting to fade away as awareness spreads about the problems in academia and the fact that the tenure track is a minority employer of PhDs now. I can’t speak for everyone else, but the academic mindset in me has given me a narrow set of operating parameters. There’s a need for evidence that we’re more flexible that isn’t well demonstrated, even if it’s true. I’m a blogger…so I guess I have that going for me as ‘flexibility’ goes. There are altruistic reasons people get into academia. It’s knowledge generation, it’s solving puzzles and answering questions, it’s doing something for the long-term. While industry and companies in the private sector might have some of those things, the sense I have is they’re all about a short term gain. There’s nothing wrong with that necessarily, it’s just that many academics are geared to be the shoulders of the giant that future researchers will rest upon. It’s a different mindset. And some academics may fear the ‘fast pace’ they hear about in the private sector– the fear being that deep thought does not occur in those places (it probably does on some level, but decisions are made with far less than complete info). There’s also the mindset that career searching, networking, and other experiments like it aren’t very hypothesis driven. I think there’s a generation of scientists (me among them) that really think the only acceptable kind of work is hypothesis driven. Observational studies are a joke and anything open ended, the ‘fishing expedition’ (aka mutant screens), are bad. Of course, good science can come out of all of these things and all have their limitations/advantages, but the hypothesis driven questions currently reign supreme. And career searches and transitions, dating, the stuff of life may have testable hypotheses, but are far from well controlled experiments. We’re taught to take some risks with experiments, but even then there’s a need for proper controls, clean environments, etc. We’re taught to try to control for any chaos to measure what we need to measure. We want elegant experiments (think Pasteur’s flask experiment), but those aren’t easy to do with personal exploration or life. Of course, scientists are also people…and I know I’ve been in my own particular ‘work is my life’ bubble for so long that it’s hard to know if I’m a complete freak/weirdo. Most scientists I know have significant others, some have kids, and they get their science done. Those ‘normal’ people do seem more able to handle transition. I think there’s a sense with PhDs and postdocs that we need permission to do anything from PIs, committees, or other mentors guiding our work. While that is true in other professions as well, the power differential between postdocs and PIs is (or seems to be) greater than that between most boss/employee relationships. And last, every academic I have met has some degree of obsessiveness about them. A perfectionist (in the bad sense) streak that can induce analysis paralysis and make taking action, especially different and uncertain actions, harder to take. Too many academics probably have the so-called fixed mindset (as opposed to the much healthier growth mindset). I don’t fully know what holds me back, and I am moving again. Learning, trying new things (still in this experimental phase, I feel), but still pre-occupied with science. There’s also the ‘how do you know when you’re done?’ in academia…there’s always more that can be dug into (including in this post, I’m sure). I think there’s an Einstein quote that says something like ‘you can’t get to a new place with thinking that got you where you are now’…so the challenge for the new career path seeking academic is partly one of trying to think differently about a lot of things. And that isn’t easy, but is possible. We are creative, intelligent, sometimes funny, and odd thinkers. Thinking differently and changing our minds is what we’re trained to do. Author Ian StreetPosted on January 22, 2015 Categories 2015, Academia, anxiety, ask, career, Change, comfort zone, Daring Greatly, depression, disconnection, Doing something, good habits, growth mindset, Ian 3.0, impostor syndrome, Introversion, learning, Learning deeply, mindfulness., perfectionism, Postdoc, postdoc experience, science, science careers, science culture, showing up, shyness, socializing, STEM, trial and error, Uncategorized, vulnerability, writingTags science, Science CareersLeave a comment on Career planning. This was my year to do things. And I kind of did. I’ll outline it below in roughly chronological order. And I’m grateful for all the people that helped get it all done. I did some things/created online content for a startup called HappiLabs, go check them out; they offer a virtual lab manager and auditing of your lab supply costs. Both are good things for any lab. It was a good close look at the entrepreneurial spirit. I may not have it in me to do just yet, but then perhaps I just lack an idea I’m passionate enough about and a market where that idea would be valued. Regardless, it’s a world I like being in/around and hopefully I can contribute in bigger ways going forward. I took on an online course in content creation for thought leaders created by a great blogger & doer of things, Sarah K. Peck. I learned a lot about content creation and that lead to my guest post on the ASPB blog “Communicating Plant Science in The Digital Age” that I am pretty proud of even though I know it’s not perfect (trying to list twitter accounts by numbers of followers as a proxy for scope/influence is a bit futile; though my point was valid that I couldn’t find a single plant scientist/organization with over 50k followers compared to other fields). That also lead to me doing some blog coverage and twitter coverage of the ASPB annual meeting and espousing the great uses of social media for scientists. While being far from an internet celebrity myself, I’d like to think I see it’s value, and I know I’m far from alone as it seemed everywhere I turned this year articles were being written about scientists doing online stuff and winning all the awards and things or something like that. Though that may be confirmation bias at work. Regardless, it’s a world I like being in/around and hopefully I can contribute in bigger ways going forward. I got to talk about my struggles with depression to fantastic science writer Carrie Arnold and what some of my solutions were/are to dealing with it and I still would love to have a job where I got to help academics/scientists improve their mental health as well as improve the system that can impinge upon it. Because I can’t change the system (or at least don’t quite know how/not currently in a position to affect change), I focused on what I can do myself while recognizing it is not fully sufficient to address the systemic pressures that academic scientists face these days (Nature ran a series called ‘ending the doom and gloom’ that I thought was interesting, and tried to at least offer a different narrative even if it’s one I don’t fully agree with). I got to talk about it in a webinar for Bitesize Bio, which was a great experience, though I don’t know if I did the best job addressing what the audience wanted. And I think I may have ignored the webinar software chat box if anyone was trying to get a hold of me during it…oops. I am still quick to criticize myself and note things I need to work on, perhaps hypercritically. Another thing I learned a lot about this year is privilege (I am still learning); I know I am fortunate in many, many ways and benefit from being white and male in ways I don’t see most of the time. Depression, however, is something that can fully stop anyone and is a factor in ending too many promising careers and lives– Stefan Grimm being a recent example in the STEM world (I wondered here if my experiences with depression informs reasins why I am a feminist). Even one is too many. So tragic and it always drives me to tears whenever I hear a story where a person takes their own life. And though it hasn’t happened so far as I know, I still worry that being open about depression will negatively affect my career. I worked on a sequel to my first ASPB essay (linked above) that I can’t seem to get down on paper well; it’s about how we need diverse voices and communicators in STEM fields (that is an obvious statement it seems to me). And somehow linking that to teaching, writing, and mentoring— the marginalized skills academics need to have but aren’t really counted need to be valued more. If not for the writers, teachers, communicators, we wouldn’t all have the knowledge we have today. It would remain locked up in the Ivory tower, and even worse within each sub-discipline in those towers (cross pollination of ideas is a good thing, in fact it’s often where innovation seems to come from: take an idea from one domain and apply it in another). It may not be as dire as that, certainly, but that’s the fear, that without a network of dedicated communicators that knowledge, science, and ideas, will just not get out into the world. Speaking as a scientist that is working on bettering my communication skills, it can’t be left up to pure researchers all the time. Different people have different skill sets and even interests that certainly can overlap (i.e. scientist and communicator of that science). Maybe I’ll keep working on it. …somehow linking that to teaching, writing, and mentoring— the marginalized skills academics need to have but aren’t really counted need to be valued more. If not for the writers, teachers, communicators, we wouldn’t all have the knowledge we have today. It would remain locked up in the Ivory tower, and even worse within each sub-discipline in those towers. In the domain of wanting to upgrade my skills, I attended WiNGS (Workshop in Next Generation Sequencing) at UNC-Charlotte which was good as far as it went, but too short to really get any mastery over the software and techniques involved in next-generation sequence analyses (but several fantastic talks). I also took a MOOC in social network analysis that was interesting, but still feels a bit beyond me at this point. I am still trying to ‘get’ software that is now standard use in academia. All of this feels like movement though it feels uncertain that it really is. I am gradually learning new things, or at least exposing myself to some new horizons. I even bought into the Adobe Creative Cloud and been using that for various projects both work and non-work related. Mostly teaching myself how to use a few of the software packages; they’re probably do far more powerful things than I will likely ever use them for, but getting into some photoshop/graphic design is fun for me, even if I’m not great at it (yet). More learning. I also participated in a lot of the Finch and Pea (specifically Josh Witten’s) twitter hash tag games putting science into popular culture. I mention this because it’s just one of the most fun things I have contributed to. And I suppose I can claim it was practice in honing my wit. Though other people are amazingly witty. That brings me to where I am now. Working on my science in the lab still, though science is not something I see myself doing in the long term or even being a full time academic. However, the skills required of an academic are still the ones I naturally gravitate toward liking/using. I like to teach (though I haven’t had opportunity to do it lately), to communicate— via keyboard mostly, but have gotten a lot better in person. Hopefully my writing has improved and my point gets across better than in the past. Just where do I go from here? I am still not sure. Am I even ‘enough’ to do anything in this world? And what projects will be both help me grow? These are still questions and I still need to explore. My new mission is to start a blog to talk about the science more than the culture of science (who knows if that new project will go anywhere). I’ll likely never fully abandon speaking about the people that do science and how we can improve the enterprise of doing science. And of course, I’ve maintained this blog throughout the year and that’s still a fun activity for me even though I worry about sharing my thoughts with the world sometimes. Two of my favorite posts this year are the tour of NEB I got to take (fantastic place and people there— seriously consider using their products) and reviewing a book on the academia-industry transition. I know I get things wrong. I am not so sure that my voice is even needed in the world. Other people say similar things to bigger audiences than I do. And for all the connecting I’ve done this year, I still feel disconnected. Like I don’t know how the world works. I still feel like I’m on an island, not deeply connected. Just where do I go from here? I am still not sure. Am I even ‘enough’ to do anything in this world? And what projects will be both help me grow? These are still questions and I still need to explore. I had the pleasure of seeing John Hodgman perform live. The last few years, he’s had a theme of post apocalypse existence and meditating on just what existence means, why we’re here anyway and just who we are and what our value is as humans. First, he was very entertaining and fun. And it made me think about my value, just what’s important to me and how I can best do it as we all have limited time to do things and accomplish them. Other than what’s cited above, I’m not sure I have a good answer and still struggle to define what value I bring to the world. While I don’t feel embarrassed to exist anymore (as I really did when I was deeply depressed), I also haven’t gotten to a point where I can confidently say ‘I am a valuable person and here’s what I am about, here’s my contribution that I am making’. Ideally that contribution is some sort of work I can get paid to do (whether a passion of mine or not, but something that I am engaged with). Getting moving again was important. Getting exploring was important. Starting to use the resources available to me was important— much more of the same needs to happen. Perhaps I’ve started a spark that can grow into a small fire. The You are no so smart podcast (YANSS) reminded me about the Dunning Kruger effect that says the skills to evaluate how your doing at something are the same ones that make you an expert at something. So we’re not all that good at evaluating ourselves, basically. So that means seeking useful external feedback that I have tried to do more, but probably not enough. It’s part of networking; put ideas out there and see what comes back or better, ask specifically for what you’d like to get feedback on. Most often, if I ask for feedback, I get no response, which I still take to mean ‘nothing about what you wrote makes sense’. Even when I do get feedback, I worry that people are just being friendly/nice…I want to get better, but do understand that feedback can be hard to give. It’s a part of the growth mindset I have been trying to adopt. It’s hard to put my work out into the world when I grew up (far into adulthood too) with a perfectionist/fixed mindset that stops you from doing anything until perfection happens. I am trying to say “Done is better than perfect” more now. From where I am, I feel like I have years of negative feedback ahead before someone might genuinely say ‘this is OK’. Partly, it’s being smart enough to know when to be confident and when being humble is appropriate– probably the latter occurs more often than the former (this according to Dr. Dunning on YANSS). I did a lot this year (not all of it is in this post). I’m not sure how much was meaningful or productive (again, I fear confirmation bias, I should look into my blog analytics perhaps). Or how much of what I have done is genuinely moving me forward. Getting moving again was important. Getting exploring was important. Starting to use the resources available to me was important— much more of the same needs to happen. Perhaps I’ve started a spark that can grow into a small fire. Cat yoga, Millenium Falcon pose. 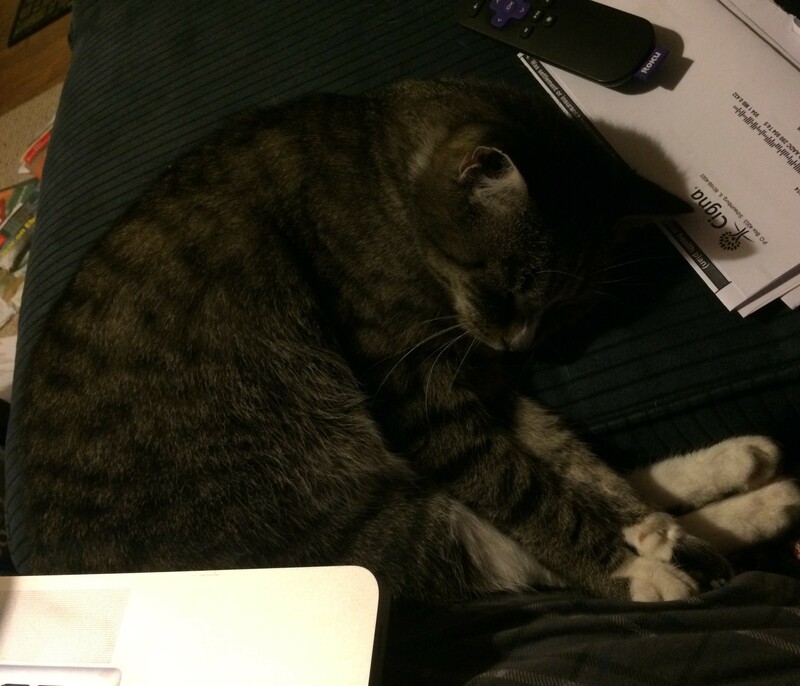 I adopted a cat (see photo). He’s 10. And friendly. And has no front teeth. And he’s a cat. He serves no real function other than being a cat. He and I share that we are both, on the surface, probably not that useful (at least that’s my feeling about myself too often). But I have opened up more with people because of my cat, if only to find someone to take care of him when I travel and that has made me more willing to ask for things in other areas of my life too. There are still things on my list that are really important to accomplish. Getting more on top of my organization schemes, getting rid of old things, deciding faster, finding a job, publishing my work some how, learning more and better data analysis techniques (writing scripts, using R to analyze data, making figures within R, maybe even getting to gene expression analyses from published data sets). And of course, measuring my goals better than I do currently and going in with an idea for what I might get out of an experience. At some point, though, the ‘always be improving’ mantra is exhausting and I need to feel like ‘enough’ where I am now. And of course, I need to be wary about my depression and hope it truly is mostly in the past. I had a scary few days last month where I was back in a horribly depressive mood, but I have since come out of it and that’s a good sign that it was a temporary state. Before, it wasn’t or didn’t seem to be. Some of this is a feeling of burn out from pushing myself this year and still lacking enough restorative activities in life. Building resilience is really important too and some of that begins with what I’ve been doing the last few years— getting to know myself a lot better. Here’s to an even better 2015. Not just for me, but for all of you readers too (this blog may not be far reaching, but I am grateful for anyone that does read/stop by). I look around and see the many amazing things everyone else is engaged in doing (Some of that can be seen in the links above), and as much as I celebrate other’s accomplishments or even sometimes support them directly (e.g. investing via crowd funding of science like Paige Brown’s analysis of science bloggers or Jaquelyn Gill’s student’s project on The Falkland Islands), I still long to be that generator myself, making something someone else finds useful. Success tends to build on itself and I hope I am connected enough to keep building. Author Ian StreetPosted on December 9, 2014 December 9, 2014 Categories 2014, anxiety, ask, Bias, big data, career, Change, changing outlook, comfort zone, creativity, Daring Greatly, data analysis, depression, disconnection, Doing something, Engage, feminism, good habits, growth mindset, Ian 3.0, impostor syndrome, learning, Learning deeply, mindfulness., my brain, perfectionism, Postdoc, postdoc experience, science, science careers, science culture, showing up, shyness, socializing, STEM, teaching, thank you, trial and error, vulnerability, winter, writing, year end reflectionsTags Blogging, content creation, depression, learning, Mental health, reflection, Science Careers, Science Culture, writing2 Comments on Meditating on 2014. Final short post of the week. This has been a good exercise for me, I think. I read an essay by Steve Pinker today about academese writing, it’s origins and just why, even within a field, academic writing can be so opaque. It was a long, but interesting read. And I am guilty of the academese style myself. Some of it is lack of training. We focus on research, not writing even though that is a key component of science. If a hypothesis is proposed and no one can write it down, was it posed at all? There’s more to it, but it is one of those things that really has always bothered me about academia. I’ve discovered that I want to be more of a creator. A collaborator, a communicator. Beyond just the narrow confines where I’ve been cloistered my entire academic career. It is letting light in through the cracks that are now bigger than even in my mental world (whereas before, I felt very locked in a box). So there’s progress, but being able to feel like getting ideas out is OK is something academia needs to work on more. We may wall all be impostors, after all, teh nature of science is that yes, we know a lot empirically, but also live in a very uncertain world where things can change. I’m probably guilty of academese in my blog posts. Barfing rainbows & power of positive thinking. Science Careers published a story this week about a study of 200 postdocs that concluded that postdocs who think positive thoughts handle stress better. @SciTriGrrl made me aware of @doc_becca’s post on it, which explains better what I was going for in my tweet. Postivity is one of those things I just can’t stand a lot of times; it rings very false to me. I had a discussions about it on Twitter with several people, including Jim Austin, the editor of Science Careers. I also took the time to go look at the study; I’m not a social scientist and so am not really qualified to review their data/results in any detail (the figures kind of enraged and confused me though). So if anyone qualified wants to enlighten me as to how to read these results, feel free. 1. This is a study of a postdoc population which is not very common and in the introduction, they do seem to understand the problems postdocs face and that it’s a good population to study stressful/depressive/anxious responses in. I hope for more (and hopefully Science Careers will doa better job writing them up; I think the headline really was what rubbed me the wrong way earlier today). 2. The conclusions are nothing revolutionary or Earth shattering: having positive coping strategies is probably a better way to live/deal with life. And that’s what they conclude. So good job confirming past research. Being resilient is a good trait to have. Positive coping strategies: planning, exercise/hobbies, family/friends/support, these are all good things. 3. They gave out prizes for postdocs who filled out the survey: $5 Starbucks gift cards and “inspirational quote cards” (this detail just made me laugh- sorry to bury the lead). Now, here’s the thing. I was a highly depressed postdoc. I still have vestiges of it. More often than I like to admit, I mutter to myself something like “just kill yourself” or “You’re worth nothing” or “I hate my life”. I can dismiss this more now, but I don’t think well-adjusted humans content in their lives say stuff like that to themselves on a regular basis. 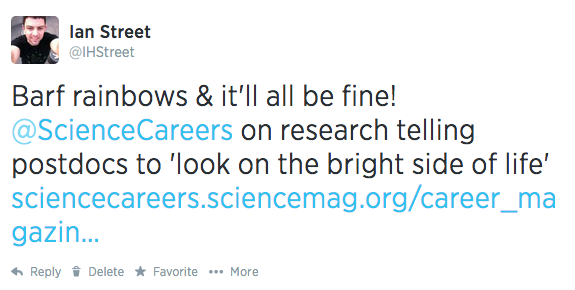 And while I think building resilience is a good thing, the Science Careers piece read more as “Just think happy thoughts and everything will be fine, or at least you’ll be good at dealing with it”! I don’t buy that. And the other thing is that I was that messages to ‘think positive’ and ‘be resilient’ aren’t messages that are helpful with a depressed person. I know because friends and therapists tried giving me that message and it always rang false; all positivity did was make me feel worse, especially the false positivity peddled by things like ‘The Secret’, etc. I had to find a different way of thinking, a more positive way, but it took YEARS to find them. It wasn’t a simple switch. And look, all the planning and positive coping strategies in the world aren’t helpful in the current job environment, the level of uncertainty alone is higher than it’s ever been. I’m not sure how to plan into it. Positive thinking (or at least not outright depressive/negative all the time) is necessary for success in science, I think, but not sufficient in a lot of ways (maybe you’ll have a better life, which I guess is good too). 1. The Nerdist Way– A book by Chris Hardwick (Nerdist podcast host) was one of the early books that started to turn my mind around. And podcasts of many types also have helped me a lot to realize I’m not alone, but also help me laugh and sometimes cry at other people’s stories. 2. Lifehacker.com– a website I read to this day. So much good stuff like this today on going to graduate school (seems solid to me; probably too late for me to make much use of :-/). Easy to go overboard and overdose, so be mindful, but it’s a fantastic resource. 3. itstartswith.com– Sarah’s an entrepreneur, trying to figure out how best to get things done; her voice really worked for me. Yes, she’s very positive/upbeat and all about positive thinking, but is also well grounded. 4. Twitter & starting my blog: I had nothing else in life, so I decided to start a blog. About depression and the fight against my own brain. It’s been a good journey and is actually providing me with some opportunities I am truly grateful for (thanks for reading anything I’ve written!). And twitter is an amazing networking tool. 5. Quiet- by Susan Cain. This book helped me identify my nature better than any other…I’m an introvert and that’s OK (as opposed to how I thought of it before- there was something truly, fundamentally wrong with me). 6. Brene Brown. This was another one where I had to say ‘really’? But then I saw her TED talk, it dove tailed well with research I’d been hearing about from Carol Dweck about Growth Mindset and Kristen Neff on self-compassion. ‘Wholeheartedness’ (I do kind of barf at this term; but it does have real meaning) is not easy, it’s hard work, but it’s also a better way to live in my mind. 7. And more. Go find things that work for you if you’re depressed. But also do things that challenge you regularly, talk to people out in the world. Listen, then see if you can assist. Growth mindset, exercise, meditation, compete (but celebrate other’s successes when they have them), and get out of the comfort zone/capacity zone more (I wish I did this better than I do). There is a way to do positivity that works well and it’s much better than being an isolated negative person (which I was; and still can be at times, which I still find tragic…). Go read other posts in my blog if you want to know more: this is what I write about a lot. Not positivity per se (‘Winter is coming’ is an apt way to put how I feel a lot of the time), but how to be productive in the face of uncertainties of the academic (postdoc) life. If I were better at networking, I’d gather other postdoc’s stories here too. Better we postdocs try to figure our way out together as opposed to tearing each other down. I don’t have all the answers, but I hope my writing helps a few people out there. Author Ian StreetPosted on July 24, 2014 July 8, 2015 Categories 2014, anxiety, ask, career, depression, disconnection, good habits, Ian 3.0, impostor syndrome, Introversion, learning, Learning deeply, mindfulness., my brain, Philosohpy of science, postdoc experience, science culture, shyness, trial and error, vulnerabilityTags anxiety, depression, positivity, Postdoc, Science Careers, vulnerability2 Comments on Barfing rainbows & power of positive thinking. Note: Slight trigger warning here. I talk about depression and suicidal thoughts herein. For those who could care less about such things, read on! I want to let go. I want all of us to let it go. The cold will never bother us if we do. I’m pretty convinced. Read this and this from Sarah K. Peck and Andrew Rubin, respectively. We exist in a state of terror as young scientists (or a lot of us do, perhaps some even unaware– the terror can be hard to distinguish from the air we breathe). With the pressure to be perfect. With the fear of making mistakes. With the fear that anything but the tenure-track is ‘failure’. Fearing we’re not one of the super-humans that can ‘make it’ in science. Vulnerability isn’t allowed (The beginnings of change, innovation, learning, and purpose– not necessarily fabulous wealth/success, but deeper satisfaction in work, definitely). I spend a lot of time thinking about what makes scientists able to produce high quality work. The conclusion from my anecdotal experience is a combination of effort, space/time to think, permission to make mistakes, an iterating growth mindset, some autonomy, and an open environment where learning from one another is encouraged and people aren’t afraid to ask for things they need (no, that does not mean always getting them). And my own watchword here: Don’t become clinically depressed. Learn the signs and if it seems like your emotions have been flattened for a few weeks straight, seek help, nip it in the bud quickly. Believe me you don’t want the feeling that you & the world would be better off if you were dead (in part because you functionally don’t fully see the difference between being alive and being dead), hoping a bus will run you over. That’s not a brain space for doing good science; you can do science, but you certainly won’t be firing on all cylinders. Even now that I’m a lot less depressed, my mind still has those thoughts sometimes. It’s a mental habit I’m trying to get out of still. Chris Hadfield talks about fear and danger and how to take risks and be prepared. 15-20 years of training in every possible scenario and then you can launch yourself into space. Get started learning the whole system you’ll be working in and you’ll be ready to take chances and put yourself out of this world. And yet, today’s academic system doesn’t instill that very well (or doesn’t allow the time for that to happen; the long learning phase seems to get clipped off even as experiments get bigger, more technical and more complex). The work has to get done and yet there seems to be ‘no time’ for training people to do it even though we’re labeled grad students and postdocs; both considered ‘training phases’. Fantastic mentorship exists and there are people that thrive, but I’m sure we can do better, do better work and improve the scientific enterprise without making a sizable population of participants within it mentally ill (again that does not mean it shouldn’t be hard; science will always be hard work and take effort). Feedback is often judgmental and harsh, instilling a fixed mindset, believing learning isn’t possible, but that our talent/intelligence is a fixed trait. Pressure and uncertainty can be paralyzing. One misstep and we’ll be unemployable forever. Nothing but academia is acceptable. Don’t tack against the wind. If you’re not in the lab, you must be wasting time. And if you can’t do it on your own, don’t bother. Collaborate and be a good citizen, but stand out. Work alone, but as a team. Being able to learn, problem solve, ask good questions, and perhaps be unleashed to do grow and do great things somewhere won’t happen because you’re convinced you’re an impostor. There’s a fog that settles over your mind. You have dead eyes. Helplessness sets in. I’ve felt all of these things and I’m starting to get to a place where the cold doesn’t bother me anymore. There’s a space for me somewhere; either in science or not, I don’t know, but it exists and I can rule there, even if it is just me writing for a small audience on my blog. Let it Go. We’re all human. Fallible and ridiculous creatures. Take the work, but not yourself, too seriously. Try stuff. Figure out how to do it in small scale first if it’s something new to you that will be big later. And write. Write it all down– take notes. And don’t be afraid to get your work out there or toss out ideas (guess what, vast majority will be terrible and probably wrong, who cares?). Always feeling like I did the rational thing hasn’t worked. So I’m trying irrational (to me; often that means leaping without 100% certainty of outcome…obviously I still try to be as informed as possible ). I adopted a cat a month ago. That makes no logical sense for my life, but I think it was a good decision for the most part. My joke about this blog has been that it’s about what not to do as a postdoc/academic. I hope it’s helped a few people, mainly me, of course, because I write for myself too (and it has helped me). Success is not a straight road. It’s a maze with lots of blind turns and dead ends. We won’t all end up in academia, but I’m sure most of us will find satisfying work somewhere, some how. Let it go. All of us. We’ll likely do better work, help each other more, give better feedback, and not always act so terrified of everything and everyone. Funding is tight, work/life balance doesn’t exist, we don’t know enough to advance to the next phase since you only get hired to do something someone needs done, who can demonstrate they’re awesome in a loud way (never mind if they’ve hastily published crap papers in high profile journals…it’s out there, so they must be good somehow). I feel passionate enough about studying the ideal knowledge worker that I’d be willing to switch fields and make a study of just how to optimize humans to do science. It’s certainly not a one size fits all formula (e.g. it’ll likely be different for introverts and extroverts), but as with depression, there are likely hallmarks of it as well as individual level manifestations. Keep going. Get out into the cold. It’s not as bad as you think/feel, we’re wired for survival (take that from a former near-suicidal person). Expose yourself to small ‘dangers’ at first and watch yourself grow. It won’t be pretty. Winter is always coming. Staying in a warm cocoon leads to mere survival whereas the science enterprise not only must survive, but thrive as well (advancement & knowledge is our business). I’m sick of mere survival for myself. Let it go. Author Ian StreetPosted on May 24, 2014 Categories 2014, anxiety, asking, brain state, career, Change, changing outlook, Daring Greatly, depression, disconnection, Engage, evolution, good habits, Ian 3.0, impostor syndrome, Introversion, learning, Learning deeply, mindfulness., my brain, perfectionism, philisophical, Philosohpy of science, postdoc experience, science, science culture, shyness, socializing, teaching, trial and error, Uncategorized, vulnerability, winter, writingTags Chris Hadfield, depression, experiments, Knowledge workers, learning, Let it Go, Ph.D. student, Postdoc, Science Careers, teaching, vulnerability, writingLeave a comment on Let it Go.